Discover the brand new Seabourn Ovation and experience the new era of 6 star modern luxury cruising. Designed from bow to stern to deliver excellence, glamour and an element of surprise. 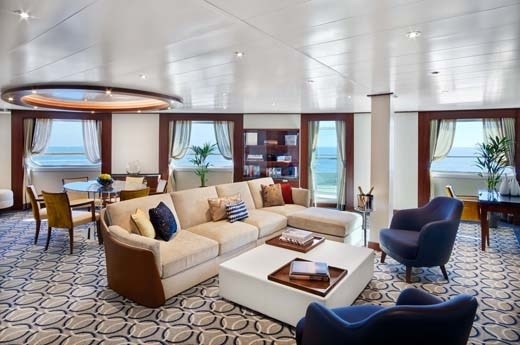 Introduced in 2018 Seabourn Ovation is Seabourn newest addition to the already prestigious fleet and is sister-ship to the Seabourn Encore. Both ships represent an evolution in small-ship cruising and will deliver a cruising experience that is second to none with a sophisticated and elegant cruise for which Seabourn are renowned. Admire Ovation’s magnificent interiors which have been designed by award-winning hospitality designer Adam D. Tihany. His touch brings the ship to life and will delight and surprise - from the elegant dining venues, lavish lounges and enticing finer details. Seabourn Ovation will carry just 600 passengers and has 12 decks that will offer a wealth of new concepts, illuminating ideas and exudes luxury throughout. The ship has been designed to offer guests the air of a private yacht. Every public area, every suite and every finer detail has been mastered to perfection. 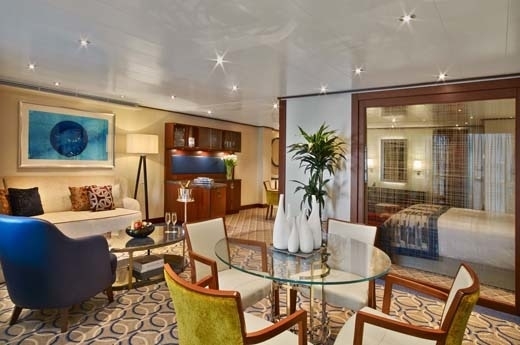 From the lighting, to the high ratio of space - your Seabourn experience will feel like it has been created just for you. On board you will find five world-class dining venues, a wellness spa, casino and many areas to relax and unwind. 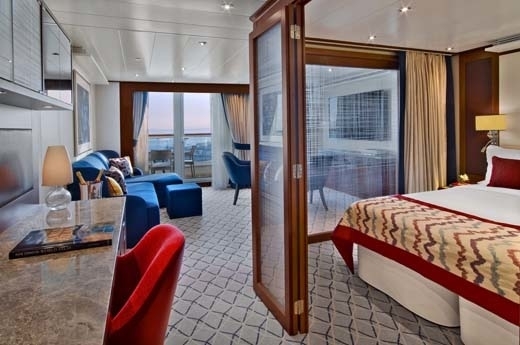 Seabourn Ovation is an all-suite all-private-veranda vessel that will allow you to feel at home, however the difference will be a glorious new view every morning. Suites are spacious, well-designed and rich in small gestures. All 300 suites offer guests a comfortable seating area, luxurious all-marble bathroom with Molton Brown toiletries, a well-stocked in-suite bar and personal entertainment system. Your 6 star award-winning dining experience will be revolutionary, with Seabourn delivering gourmet cuisine that rivals the finest restaurants on land and sea. With five world-class restaurants you will be spoilt for choice, including the main restaurant, The Grill by Michelin-starred Chef Thomas Keller, The Colonnade, The Patio and The Sushi restaurant. As mentioned, perfection is seen throughout the ship, even when it comes to the food on board. Seabourn Ovation's masterful chefs will only use the freshest quality ingredients, delivering mouth-watering flavours from around the globe. What’s more, dining arrangements on board are open-seated, allowing you the flexibility to dine when and with whom you please. The Grand Salon is the hotspot for evening entertainment, offering a range of enthralling entertainment, from classical musicians, dancing, musical shows, cabaret and comedians. In the day you may also find guest speakers and cooking demonstrations. If you fancy a pre or post-dinner drink, there's a number of bars and lounges available offering complimentary alcoholic beverages. If you are looking to savour the flavours of one Seabourn’s elevated cocktails, head to the Observation Lounge with sweeping sea views and a central skylight with a spectacular design of a school of fish. If you fancy something a little more lively, head to Deck 5 where you will find The Club - an elegant lounge that is ideal for music, dancing and socialising. If you feel luck is on your side, head to the casino hosting slot machines and tables for blackjack and roulette. As you enter Seabourn Ovation's wellness spa you will be mesmerised as you are greeted by a two-deck-high waterfall - a truly remarkable addition to the facility. The Spa at Seabourn is the ultimate spot for pampering and offers a full range of spa treatments, salon and an area to relax and unwind. Here you will find a hot tub, thermal suite and the Kniepp walk-in-water experience. For the first time on a Seabourn ship, the Spa and Wellness with Dr. Andrew Weil programme offers guests classes in mindful living, such as complimentary daily yoga and meditation sessions, as well as seminars on topics like healthy aging and anti-inflammatory foods. If you like to keep fit, the on-board gym offers a range of equipment, personal-training and yoga classes. If you’d rather take to the water, Ovation features a water sports marina at the back of the ship offering complimentary use of kayaks, pedal boats and windsurfers. 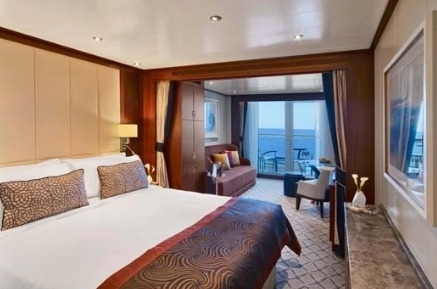 An experience on board Seabourn Ovation is one that you will remember for a lifetime and offers the ultimate pampering, thrill and indulgence all luxury cruises should. Owner’s Suites feature full length window and glass door to private veranda, dining for four, separate bedroom, guest bath, two flat-screen TVs, pantry with wet bar, convertible sofa for one and whirlpool bath. Complimentary internet/Wi-Fi service. Approximately between 576 & 609 sq. ft. of inside space, plus one veranda of 142 & 900 sq. ft. Includes all the in-suite amenities, plus: An invitation from the Master for a bridge visit when the ship is in port. A personal visit from the Hotel Director. Fresh orchids or potpourri in your bathroom. All-natural Molton Brown bath and beauty products including Pure Pampering bath oils. A large basket of succulent tropical fruits. High-quality bathrobes, soft and luxurious. Complimentary Internet service. A large bouquet of fresh flowers when you embark. A convenient espresso machine with a variety of coffees in your suite. Swarovski Optik binoculars in all Premium Suites Complimentary private car transfers between airport and ship. A choice of daily newspapers delivered to your suite. Wellness Bag exercise kit containing easy-to-carry workout gear available upon request. All Penthouse Suite feature dining table for two to four and separate bedroom. Glass door to veranda, two flat-screen TVs, fully stocked bar, spacious bathroom with tub, shower and large vanity. Approximately 450 sq. ft. of inside space, plus one veranda of 98 sq. ft. (9 sq.m.) In-suite amenities include: Fine Egyptian cotton linens, fluffy duvet, down or hypoallergenic pillows, robes and slippers 24-hour complimentary room service In-suite bar stocked according to your preferences Fine soaps such as L’Occitane and exclusive Therapies bath products by Molton Brown, London Personalized stationery Flat-screen TV with music and movies Wi-Fi and cell phone access Internet access on board is subject to a nominal service charge based on usage. This nominal charge serves to limit usage to some extent and thus improve the performance for all our guests. Guests simply register at the Seabourn Square terminals to set up an account, which is charged to the guest’s shipboard account. The basic charge is 40 cents ($.40 USD) per minute. Several different advance purchase plans are available on board at lower rates, to accommodate individual needs. Time purchased as a plan may be used at any time during the cruise, either at the terminals or wirelessly. Signature Suites feature expansive ocean views, forward-facing windows, dining for four to six, bathroom with whirlpool bathtub, guest bath, pantry with wet bar, and two flat-screen TVs. Complimentary Internet/Wi-Fi service. Approximately 977 sq. ft. of inside space, plus one veranda of 493 sq. ft. (46 sq.m.) Includes all the in-suite amenities, plus: An invitation from the Master for a bridge visit when the ship is in port. A personal visit from the Hotel Director. Fresh orchids or potpourri in your bathroom. All-natural Molton Brown bath and beauty products including Pure Pampering bath oils. A large basket of succulent tropical fruits. High-quality bathrobes, soft and luxurious. Complimentary Internet service. A large bouquet of fresh flowers when you embark. A convenient espresso machine with a variety of coffees in your suite. Swarovski Optik binoculars in all Premium Suites Complimentary private car transfers between airport and ship. A choice of daily newspapers delivered to your suite. Wellness Bag exercise kit containing easy-to-carry workout gear available upon request. All Penthouse Spa Suite feature dining table for two to four and separate bedroom. Glass door to veranda, two flat-screen TVs, fully stocked bar, spacious bathroom with tub, shower and large vanity. Approximately 639 to 677 sq. ft. of inside space, plus one veranda of 167 to 200 sq. ft. (16 to 19 sq.m.) Includes all the in-suite amenities: Complimentary full-day access to The Spa at Seabourn serene area In-suite spa amenities Spa concierge service Spacious bath with full tub and shower Complimentary in-suite bar stocked with your preferences Second in-suite bar stocked with waters, juices, and healthy snacks 24-hour complimentary room service Fine cotton linens, plush robes and slippers Writing desk with personalized stationary All-natural Molton Brown, London bath and beauty products, including Pure Pampering bath oils Additional Molton Brown, London specialty spa products and a menu of luxurious bath sponges Calming L’Occitane fragrance can be diffused in the suite, and a soothing music soundtrack is available on request Soaps by Hermès, L’Occitane, Baudelaire and Salvatore Ferragamo iPod® docking stations Flat-screen TVs with music and movies The option of in-suite dining served course by course PressReader mobile – Enjoy your favorite newspapers and magazines from your smartphone or tablet Wi-Fi and cell phone access Internet access on board is subject to a nominal service charge based on usage. This nominal charge serves to limit usage to some extent and thus improve the performance for all our guests. Guests simply register at the Seabourn Square terminals to set up an account, which is charged to the guest’s shipboard account. The basic charge is 40 cents ($.40 USD) per minute. Several different advance purchase plans are available on board at lower rates, to accommodate individual needs. Time purchased as a plan may be used at any time during the cruise, either at the terminals or wirelessly. All Veranda Suites feature a full-length window and glass door to private veranda, comfortable living area, queen-size bed or two twin beds, dining table for two, walk-in closet, interactive flat-screen television with music and movies, fully stocked bar and refrigerator, makeup vanity, spacious bathroom with separate tub and shower. Approximately 300 sq. ft. (28 sq.m.) of inside space, plus one veranda of 65 sq. ft. (6 sq.m.) In-Suite amenities include: Fine Egyptian cotton linens, fluffy duvet, down or hypoallergenic pillows, robes and slippers 24-hour complimentary room service In-suite bar stocked according to your preferences Fine soaps such as L’Occitane and exclusive Therapies bath products by Molton Brown, London Personalized stationery Flat-screen TV with music and movies Wi-Fi and cell phone access Internet access on board is subject to a nominal service charge based on usage. This nominal charge serves to limit usage to some extent and thus improve the performance for all our guests. Guests simply register at the Seabourn Square terminals to set up an account, which is charged to the guest’s shipboard account. The basic charge is 40 cents ($.40 USD) per minute. Several different advance purchase plans are available on board at lower rates, to accommodate individual needs. Time purchased as a plan may be used at any time during the cruise, either at the terminals or wirelessly. Wintergarden Suites feature large windows with ocean views, dining for six, bathroom with whirlpool bathtub, guest bath, Glass-enclosed solarium with tub and day bed, pantry with wet bar, and two flat-screen TVs. Complimentary Internet/Wi-Fi service. Approximately 989 sq. ft. of inside space, plus one veranda of 138 sq. ft. (17 sq.m.). 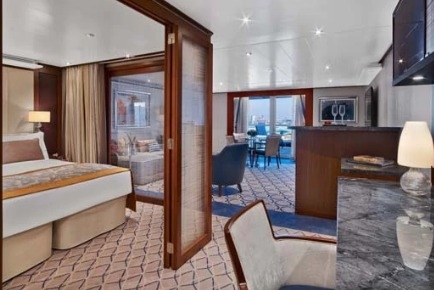 Includes all the in-suite amenities, plus: An invitation from the Master for a bridge visit when the ship is in port. A personal visit from the Hotel Director. Fresh orchids or potpourri in your bathroom. All-natural Molton Brown bath and beauty products including Pure Pampering bath oils. A large basket of succulent tropical fruits. High-quality bathrobes, soft and luxurious. Complimentary Internet service. A large bouquet of fresh flowers when you embark. A convenient espresso machine with a variety of coffees in your suite. Swarovski Optik binoculars in all Premium Suites Complimentary private car transfers between airport and ship. A choice of daily newspapers delivered to your suite. Wellness Bag exercise kit containing easy-to-carry workout gear available upon request.